" Imagine standing on a vibrational platform for just 10 minutes and getting a similar cardiovascular, musculoskeletal and hormonal response as doing an hour of exercise..." Plus, it’s fun and relaxing! You can even hook your IPOD or MP3 player into the Sonic life and the music will come up through the base and then into your body." "Sonic Life is a system that, in just 10 minutes, gives you a similar cardiovascular, musculoskeletal and hormonal response as doing an hour of moderate cardiovascular exercise. In addition, Qigong and Tai Chi masters say the movement of energy and release of stress, tension and energy blockages throughout the body is equal to an hour of practice in their perspective arts! The effectiveness of this sound/sonic technology lies in the fact that we are addressing the body as an energy system – which is exactly what it is. In addition, stress and tension are released, stagnant fluids are circulated and detoxification enhanced. Think about the difference something like this could make in your own health, and your quality of life. The Sonic Whole body vibrational device has been called space-age exercise and is truly the wave of the future in both exercise technology and wellness." "Throughout history there have been occasional breakthroughs in every field of flight, computers, medicine, science and technology. Forty-five years ago, the idea of vibrational exercise was conceived in the space program as a way to prevent bone loss and muscle wasting in the zero gravity environment of space. The results were so profound that extensive research and development of various mechanical vibrational devices followed. After spanning most of the globe, Vibrational technology finally reached the West a few years ago. There is a natural evolution to technological development after the birth of an idea, as well. At the cutting edge of this exciting field, mechanical vibration evolved into the realm of sound/sonic vibration. 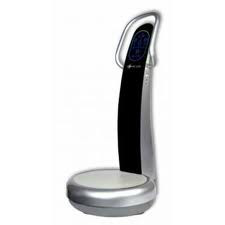 This is the next generation and technological pinnacle of whole body vibration, far exceeding the beneficial effects of mechanical vibrational exercise devices, and without the harsh Jarring vibration. 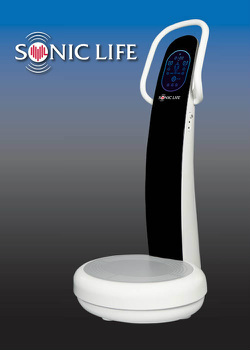 The newest patent holding Sonic Whole Body Vibration exercise machine is the Sonix from Sonic Life, falling under the same global patent, and providing an in-home, personal machine that is more accessible and affordable to the public. I would like to invite you to personally experience this phenomenal scientific breakthrough in exercise technology. Unanimously validated by over 45 years of rigorous research, vibrational exercise medicine is now used world wide by leading medical centers, clinics, spas, fitness clubs, and by top athletic teams for training and recovery. But remember, there is nothing that comes close to the powerful effect of Sonic vibration vs. mechanical. Accelerated Weight Loss... significant increase from 10 minute sessions, just 3 times a week over 6 weeks. (Bonner Physical Therapy, 2003) So even when relaxing, you’ll be burning considerably more calories with Vibration training! Anti-Aging... can prevent age-related muscle loss, increase flexibility and range of motion. It also stimulates the production of collagen, creating tighter, more beautiful skin. It’s all possible! The fact that scientific research has shown Vibration Exercise can help fight Osteoporosis is exciting. For older generations, this could well be the most important discovery in decades. Back Pain Solution... activates those ‘key’ stabilizing muscles at the body’s core – when weak, are the trigger for back problems. Circulation is increased to the problem areas, thus strengthening weak core muscles. Strong core muscles develop a better posture to promote spinal health and free us from back pain. A study at Manchester Metropolitan University showed that WBV can reduce chronic lower back pain by 70% in just 3 months. Beauty... improve circulation, carry vital oxygen to your cells and tissues, and assist in flushing toxins, while increasing your production of collagen. This results in firmer, smoother skin, with a significant reduction in cellulite! Circulation... Increased blood and lymph circulation is a notable benefit of Vibration, even at low speeds. As a result, your cells receive more oxygen and nourishment. The body also develops better lymphatic drainage to improve our overall health and immunity. It does this by taking away waste products and moving white blood cells to where they are needed. White blood cells are like the ‘cavalry’ of the body – removing debris from the broken down cells and attacking invading agents, such as poisons and bacteria. Sports... Increases flexibility and strength, stimulates muscles, increases motor learning, muscular endurance and overall agility. High cortisol levels tell the body to store fat. Whole boby vibration can reduce the effects of stress by decreasing cortisol levels (the ‘stress hormone’). Whole body vibration also increases the secretion of serotonin, the “feel good” hormone. Firming and Toning... Whole body Vibration maintains, firms and tones muscle mass while the body burns fat. Massage... Muscle massage and circulation massage can be experienced on a higher frequency setting of (26Hz to 50 Hz) to improve physical performance, prevent and eliminate injuries, reduce stress, improve circulation and assist in flushing toxins!